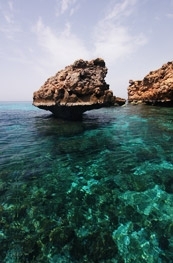 The Damaniyat Islands Nature Reserve (DINR) is Oman’s only fully protected marine reserve, declared by Royal Decree in 1996. The stunning marine and island environments are still in a near- pristine condition, and support globally significant populations of nesting sea turtles and seabirds and a range of other marine wildlife, including some of Oman’s best-developed coral reefs. Low-level fishing pressure continues to threaten marine resources, and the Islands now face ever-increasing pressure from Oman’s rapidly expanding tourism industry. Previous surveys of the Islands were undertaken in 1986, 1996 and by ESO in 2006 will enabled assessment of trends over three decades. ESO's work has now moved towards protection of the Islands through awareness, education and clean ups. The clean up initiative aims to engage the local community and ESO members in the removal of trash and debris from the DINR on land and in water. ESO aims to undertake four beach and four underwater clean-ups in the DINR area over a 1 year period. These clean-ups would serve two initial functions: identify the most common debris items found flowing into DINR, and involve local residents in a hands‐on program to clean-up the Islands. This effort will ultimately result in a publication of findings, which will report on the type and amount of trash removed and solutions to reduce debris on the Islands which can then be presented to relevant stakeholders including Ministry of Environment and Climate Affairs (MECA) and Ministry of Agriculture and Fisheries (MAF) for further conservation action.